The 59th Idea Filmfare Awards (South) took place yesterday at the Nehru Indoor Stadium in Chennai. Guests and performers included stars Mahesh Babu, Dhanush, Puneet Rajkumar, Shruti Haasan, Trisha, Rana Daggubatti, Kajal Agarwal, Khushboo, Ramya, Amy Jackson, Tamanna, Namitha, Charmmee Kaur and Sonia Agarwal. 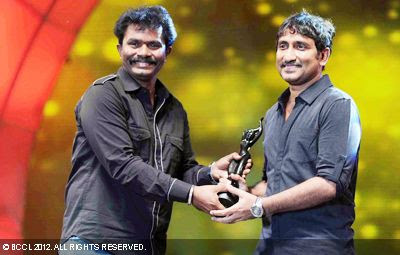 Sreenu Vaitla'a Dookudu topped the award winners on the night. It won a total of six awards in the Telugu section including Best Film. The others were for Best Director, Best Actor Male (Mahesh Babu), Best Supporting Actor Male (M S Narayana), Best Music Director and Best Playback Singer Male. Dookudu recently led the winners at the South Indian International Movie Awards (SIIMA). Not far behind was Vetrimaran's Aadukalam with five awards in the Tamil section. It won Best Film, Best Director, Best Actor Male (Dhanush) and Best Music Director, plus a Special Award for Best Cinematography. For Mayalayam films, the Best Film award went to Traffic. However, its only other award was Best Supporting Actor Female (Lena). Blessy's Pranayam picked up four awards including Best Director. In the Kannada section, Jayatheertha's Olave Mandara won for Best Film and Best Director. Those were its only two awards, though. Sanju Weds Geetha picked up four prizes including Best Actor Female (Ramya). Lifetime Achievement Awards were presented to director S P Muthuraman and actor Seema Sasi. I haven't watched kannada movies but some telugu and tamil movies are really good. Bollywood is also copying many movies from south and they are doing grt business. congrats to all award winners.... ! !